White House Chief of Staff John Kelly chats with reporters before a roundtable discussion on the MS-13 gang in the Cabinet Room of the White House, Feb. 6, 2018. Several Trump confidantes reached by ABC News said the president is considering multiple names as possible Kelly replacements, among those, top economic adviser Gary Cohn, Office of Management and Budget director Mick Mulvaney and Rep. Mark Meadows. White House chief of staff John Kelly, shown with White House staff secretary Rob Porter look on after President Donald Trump signed a proclamation calling for a national day of prayer for those affected by Hurricane Harvey, Sept. 1, 2017. Kelly, whose appointment as chief of staff was initially seen as an step towards restoring order and discipline, has been the subject of growing controversy over the past several weeks. But it was Kelly’s management of the most recent controversy involving Staff Secretary Porter that ignited a firestorm, after the Daily Mail published multiple allegations of domestic abuse by his two ex-wives. White House Chief of Staff John Kelly walks with White House staff secretary Rob Porter to board Marine One on the South Lawn of the White House in Washington, Nov. 29, 2017. 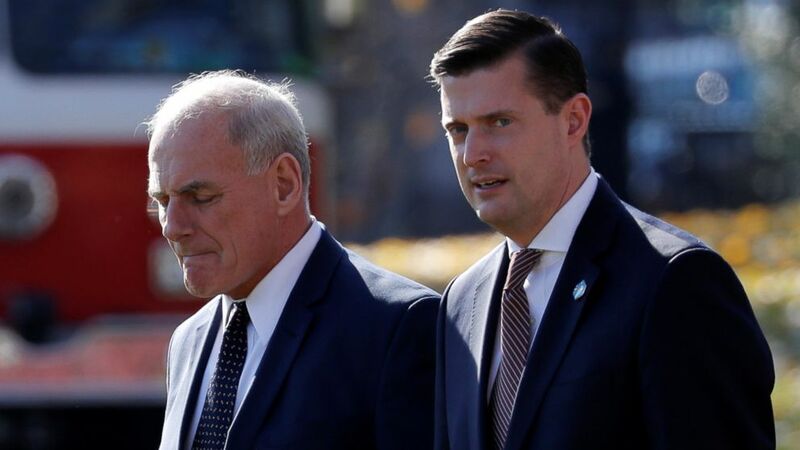 In response to the story, Kelly issued an on-record statement calling Porter “a man of true integrity and honor” but making no mention of the alleged victims. ABC News’ Alex Mallin and Meridith McGraw contributed reporting.